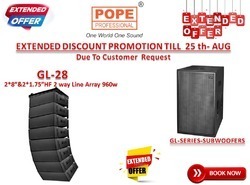 Our range of products include pope subwoofer and pope two-way top speaker systems..th635 th625 and ld215. The POPE Professional® TH-635, 2*15” Three-way Speaker 1700W @ 4Ω designed for exceptional quality and sonic performance. The trapezoidal cabinet incorporates a 2-inch exit throat high frequency compression driver which has exceptional upper frequency response yet provides highly efficient mid-range output as well. The driver fires through true ultra-modern horn, back-set to optimize time alignment with the low frequency section. The POPE Professional TH-635 designed 70° x 50° horn is composed of a rigid, non-resonant high-tech composite which virtually eliminates high frequency coloration. Integrated flying points mean the TH-635 can be easily used in any install, touring or club rig. The TH-635 is perfect for applications in medium to large sized venues, especially when used with POPE Professional XD-Series or XP-Series digital signal processor and GL-Series or L-Series sub-woofers can achieve the great sonic performance. 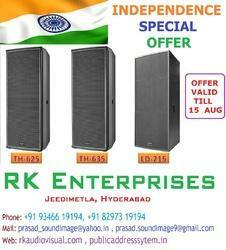 Looking for TOP speaker system ?